Welcome! I'm here with a card for the latest Fusion challenge and this time I've decided to play only with the photo. The stamp used on this card is a very old one from MFT Stamps called Inspired by the Front Porch: Fall. I think it's from 2012. I saw it somewhere and then had to go hunting until I found the set and could buy it for myself. (Yes, I'm a bit obsessive like that - I also bought the Spring version from a different vendor). I stamped the image onto X-Press It cardstock and colored it with my Copics. I didn't get too detailed with my coloring as it's a pretty big image but I think it turned out okay. I then cut a strip off the right hand side and stamped the sentiment vertically in black before clear embossing. Onto the colored piece I added a strip of black and white striped patterned paper then backed the panel with fun foam. I adhered it to a Jellybean Green card base. 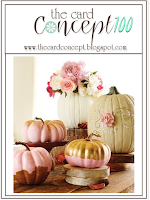 I added no embellishments, apart from some clear sparkle pen on the pumpkins and urns of flowers. Thanks so much for visiting! Please check out the gorgeous cards made by the rest of the DT and I hope you have time to join us. Accessories: Spectrum Noir Clear Sparkle Pen, Clear EP, Copics. Hi and welcome! Today's sketch for the Freshly Made Sketches challenge comes to you from the lovely Amy O'Neill. I have a confession. 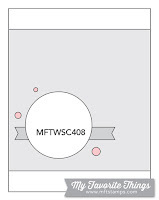 I dislike ovals as much as my teamie, Jen, dislikes circles, so I cheated and used an arch instead of an oval. We don't even celebrate Halloween here but I couldn't resist this adorable MFT stamp set and took it for its inaugural inking to make this card. I colored the images with Copics and cut them with my Scan n Cut. I added some dot detail to one of the sweets then set them aside while I worked on the rest of my card. I masked off an area on my card base and sponged some Distress Oxide inks into the open area. Once that was dry, I white-embossed the sentiment. Onto a smaller die-cut panel, I cut out an arch opening and added a stitched arch frame around the opening. I popped that panel up on foam tape and finally added my colored images. Finally, I added clear sparkle pen to the pumpkins, hat and the sweets. Thanks for popping by! I hope you'll check out the rest of the DT cards as they're gorgeous as always. Welcome! Today's card was made for a friend who suddenly lost her mother. My heart hurts for her and her family and I wish I could give her a hug in real life, but instead I made this card to send to her across the miles. I wanted to create something tasteful yet not morose and I hope this card fits the bill. I stamped and colored the flowers using Copics then cut them with my Scan n Cut. Once that was finished, I added little touches of Rock Candy Distress Glitter to the flower centres and to the buds and set it aside to dry. On the white card base, I added some green and pink patterned paper and then a white circle. Over top of that, I added a vellum overlay and I die-cut where the flowers would go with a scalloped peek-a-boo die. The sentiment was gold-embossed onto the vellum and then the vellum was adhered to the card putting little dots of glue under the sentiment and where the flowers and sequins would go. To secure the top, I added some white baker's twine tied in a bow. The flowers are popped up on foam tape and some sparkling clear confetti finished the card. 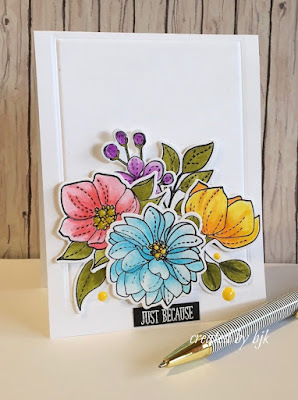 I was guided by the sketch at Inky Paws for this card as well as the inspiration photo at Card Concept where I was drawn to the gold and the florals for this Clean and Layered card. 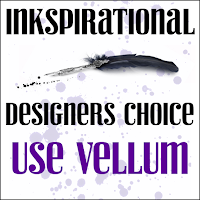 I softened the look somewhat with the vellum to add to the theme, and that also works for the Inkspirational Challenge. 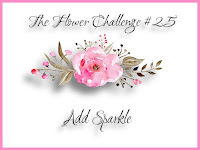 Finally, I'm adding this to The Flower Challenge who are looking for sparkle. Because this is a sympathy card, naturally I kept the sparkle to a minimum but I hope the distress glitter, the gold embossing and the sequins add enough sparkle for the challenge. Thanks for visiting! It's quite late on Saturday night, so this card will be going in the post tomorrow to wing its way across the world. Hi and welcome! It's time for another Freshly Made Sketch challenge and here is the wonderful sketch that my Aussie mate Narelle came up with. I had to use a NBUS set called Peruvian Lily for my card. These multi-step flowers are just gorgeous - hence the title of this blog post! 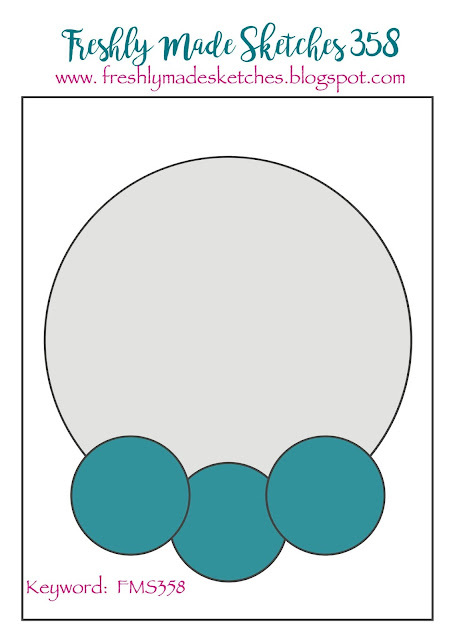 My two flowers aren't exactly where they should be based on the sketch but there is a very good reason for that. Originally I was going to use one flower and a stenciled circle underneath. So I stenciled the circle with some gray-tinted embossing paste and then positioned the flower. It just didn't look good, so I took a second flower and positioned both of them to cover up the stenciling totally. The sentiment was stamped in black and my card was done! Hi! 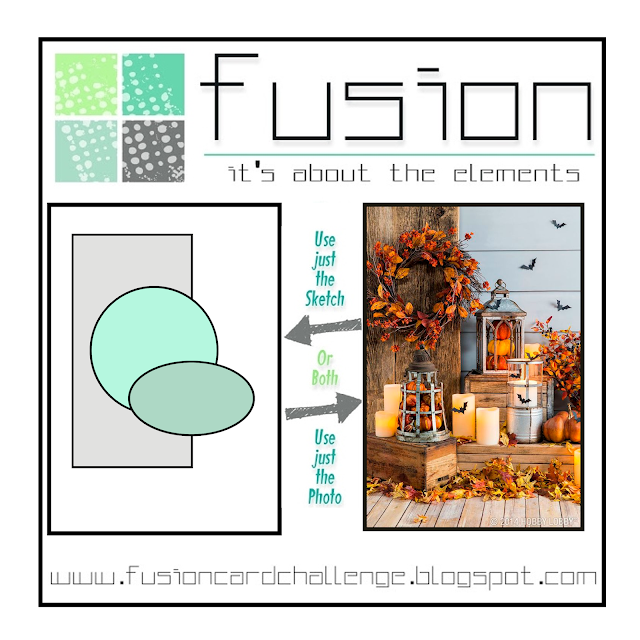 I'm here with another fun challenge from the team at Fusion and here is my card! To make my card, I started by dry embossing the Frames die into a white top-folding card base. It's hard to see in the photos, but it gives a nice subtle frame around the card. The leaves were made using various Distress Oxide inks blended onto a Bristol Smooth panel. I deliberately went for pastel shades to match the photo. Once I was done blending in a rainbow fashion, I spritzed the panel with shimmer spray. It looks so pretty in real life! After die-cutting the leaves, I arranged them onto the card base, still in rainbow fashion. I finished with a sentiment from a Gina K Designs stamp set. Thanks for visiting! The design team have some gorgeous cards, so I hope you'll check them out. 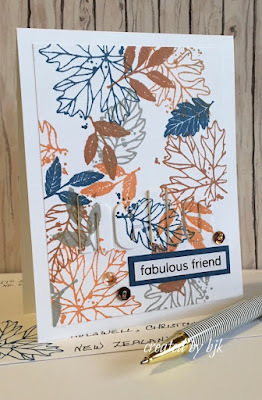 I made this card using the current sketch at MFT, the leaves theme at Paper Players and the stencil theme at Sweet Stampin'. I started by die-cutting the frame from Blueprints 27. 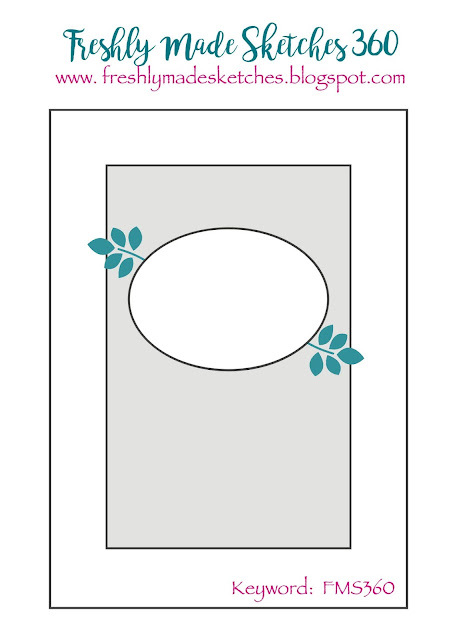 Using that as a template I lightly penciled around the outside so I knew where to mask for the stenciling. Using a very small amount of Hickory Smoke distress ink, I mixed up a pale gray embossing paste then added it over the top of the English Brick Wall stencil. I remove the masking tape and set it aside to dry. I then went to work on the leaves. I ended up using nine different distress inks to get these leaves! I kept adding color, water and dropping my sheet of Bristol Smooth in the resulting mix. once I was happy with the colors, I flicked on some Ground Espresso, Fired Brick and Peeled Paint inks. The Falling Leaves dies were used to cut from the distress inked panel and I lightly sponged around the edges with the same three inks used to flick ink onto the panel. 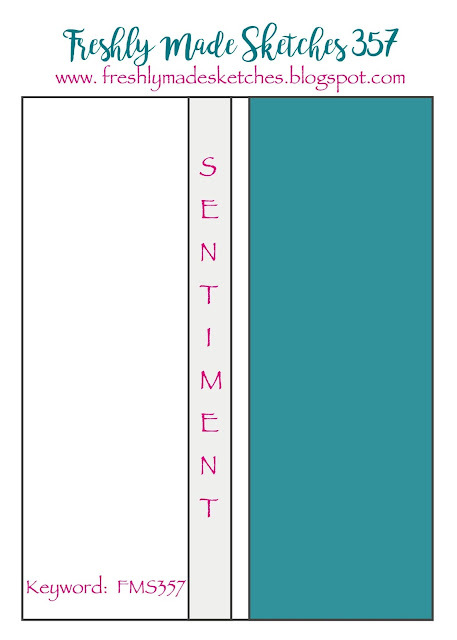 The sentiment is white embossed onto Jellybean Green cardstock and cut with one of the banner dies in Blueprints 27. Then it was time to assemble the card. The frame went down first and then the sentiment. From there, the leaves were added - either directly to the card or on foam tape. I finished with some clear droplets. Hi and welcome! I'm here with a card for the latest Freshly Made Sketches challenge and this week, I'm your hostess. 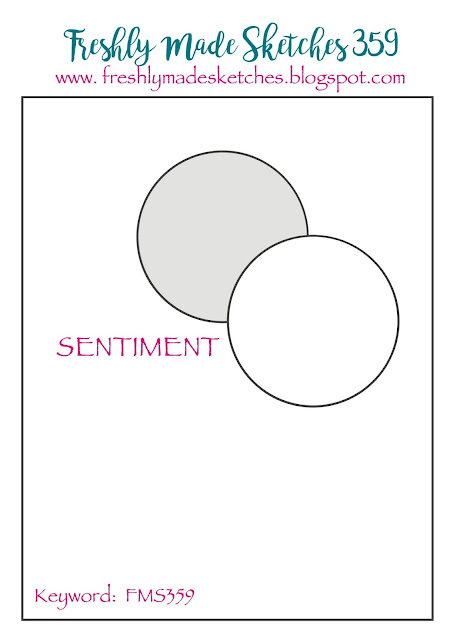 This is the third iteration of this card! The snowmen were on all three cards and were re-housed three times until I decided this would be their home 😄 I ink-blended a night sky onto a piece of white cardstock using Distress Inks and then die-cut with both the Inside/Out Stitched Circle die and the Galactic Background die. I used the dies from Scenic Snow Globe to create my background scene, adding some Snow Marker for snowy dimension. The snowmen come from last year's Stamptember Gina K set and the sentiment comes from this year's Stamptember Gina K set. To try and disguise that I stamped the sentiment a bit too far left, I added some irridescent snowflake sequins. And, in the interests of full disclosure, the smallest snowman is sitting up a little bit too high but I had to position him like that as I damaged the snowman beside him moving him around so many times! Thanks for visiting! The DT have created some gorgeous cards from my sketch so I hope you'll check them out. 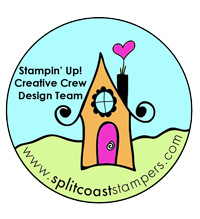 I'm going to link this up to the Holiday challenge at Addicted to Stamps. Don't you love that rainbow of boldness? I can't remember the colors, but I created it at the same time I made this card, so the colors probably come from that list. I also added some gold foil before it was completely dry. 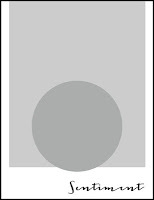 A thin strip of black separated the alcohol-inked panel from the card base. The die-cut sentiment is from Birch Press Designs and stacked three high and finished with some clear sparkle pen. Here are another couple of photos from different angles. Thanks for visiting! The DT have created some gorgeous cards with Cecile's sketch, so I hope you'll check them out. Hi and welcome! 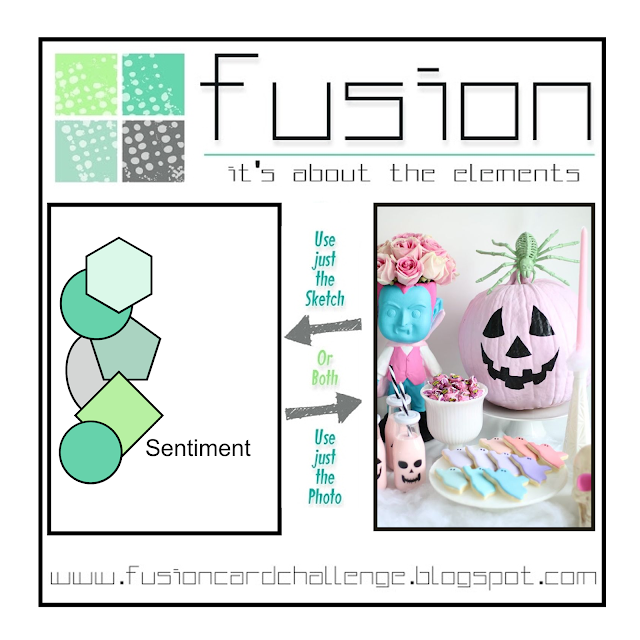 I'm here with the card I created and the two cards I received as part of the Card Chain Challenge. This month I went with the sketch and the cats theme to come up with this card, which was sent to Helen in Ohio. This adorable image is from Newton's Nook and was colored with Copic markers as part of the last 30 Day Marker Challenge, so I don't have the colors that I used. The patterned papers were die-cut with stitched dies and adhered to a white top-folding card base. The circular piece is actually foiled and is sparkly in real life. 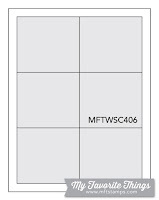 I finished with a hello die from MFT cut from Steel Gray cardstock. And here are the two gorgeous cards I received from Betty (photos borrowed from Betty's blog). I was so touched that Betty send an Autumn card as well as a Spring card, as we are coming into Spring here in the Southern Hemisphere. I am really enjoying participating in this challenge each month and I urge you to join in if you're anything like me and love sending and receiving beautiful handmade cards. 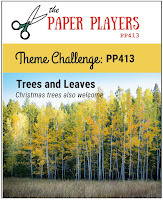 The October challenge is open until 6 October for sign-up. Here is the challenge graphic.